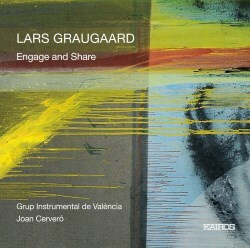 I very much enjoyed the last relatively high-profile disc of Graugaards’s music to take up residence on my shelves, a disc entitled ‘Venus’ (Dacapo SACD 6.220628), although my learned colleague Rob Barnett concluded wryly in his review that this kind of music is most likely to appeal to an “avant-garde savant”. In fact, throughout his career Graugaard has employed a thoroughly diverse 21st century musical vocabulary which doesn’t so much straddle the perceived boundaries between established genres as completely obliterate them. While a couple of the pieces on ‘Venus’ are for larger forces than the Grup Instrumental de València which performs his work so enthusiastically here, these pieces for ‘sinfonietta’ do inhabit similar technical, sonic and emotional terrain, up to a point. At least two of the titles on the new issue project something of a more populist ‘rock/jazz/techno/rave’ trope, unsurprising as Graugaard is these days more likely to be treading the boards as the DJ ‘Lars from Mars’ than playing the flute in Bach sonatas. His back catalogue encompasses many works for familiar orchestral and chamber ensembles and standard instruments, but he has of late made regular use of computer software in his output. The three pieces here, though, were all written for this Valencia group, a conventional ensemble of about 16 players. I found the most fluent music here to be in Engage and Share, the opening work on this disc. Piano, clarinet, low strings and brass chords merge into a creepy flute-led passage, and as successive sections proceed one gets a very strong sense of the original material being twisted, refined and rearranged; at 1:55 a quieter episode seems to involve the melodic content shying away from the nagging string textures, before a more grandiose, fully formed ‘version’ of the opening music takes over. This then subsides into an inaudibility that is gently punctured first by harp, piano and rustling strings and then by odd woodwind arabesques. The brief sections in this piece seem to connect with and flow into each other with a convincing inevitability. Bright colours occasionally pierce Engage and Share’s rather pallid weave. After about seven and a half minutes the music takes a turn for the elegiac, as almost yearning wind and string solos compete over an autumnal landscape, before twin violins emerge songfully from this place, and the music seems to die. My impressions are confirmed by Graugaards’s own remarks about this passage on his own website, where he refers to this effect as “…..a special, simultaneous yet inter-independent rubato”. After a brief pause this melancholy trope begins again, a reminiscing solo bassoon and horn, harp and strings seeing the work to its eventual demise. The title of the most recent piece, Slonk, apparently refers to the state of having a voracious appetite, which is musically reflected by the opposition between its stabbing ostinati and the vague, open-endedness of its alternating material, and which perhaps could be characterised as a sonic representation of biological homeostasis, the biological feature that regulates temperature, appetite and the like. Slonk begins with a loose pizzicato thud, wind harmonics and spectral strings, before it adopts insistent and agitated (techno-influenced?) rhythms led by brass. This is a piece which seems to remain frustratingly out of the reach of the listener, settling into something of a comfortable groove which is suddenly and unexpectedly inundated by nagging percussive bass gestures in piano and percussion. While textures are at times strident, they are never unappealing, and there is some attractively woozy bass-clarinet work, but the flow of the music seems to my ears to funnel into innumerable dead ends. The extended ‘rumbling’ textures which dominate its first half are gradually overtaken by rustling and wayward percussive strings, and nonchalant high piano; nor do these episodes seem to be headed anywhere in particular. It is perhaps no coincidence that Slonk is the only one of these pieces which is completely glossed over in Gudni Franzson’s notes, which drop some interesting biographical titbits about Graugaard, but provide only brief hints about this music. Lemon Henry Jefferson (1893-1929) was a gospel and blues pioneer and he lends his nickname ‘Blind Lemon’ to the earliest work on this disc, although blues or gospel it ain’t. In fact, it’s a twelve-minute essay which opens with an oddly pastoral reference on oboe, which grows into a series of lyrical interludes involving groups of three or four instruments. The occasional piano commentary is rather Ivesian in its higher registers. These wisps of melody creep in and out of the texture, and I concur with Franzson’s suggestion in the notes that the work coheres successfully in spite of the diffusion of its melodic strands, while it certainly feels more goal-directed than did Slonk. Graugaard draws a refined palette of dark or pastel hues from his modest ensemble. As the piece grinds towards its conclusion, with a rather glowering bass clarinet and trombone over a throbbing, repeated cello and bass chord, I was at times reminded of the irregular, polyrhythmic jigsaw of Xenakis’s extraordinary work for harpsichord and ensemble, À l'île de Gorée. While 42 minutes may seem short measure in terms of real time, to extend the appetite metaphor in Slonk there is enough musical nutrition in these three items here to justify the conceit of the disc as a whole, while leaving a little space for future samplings of Graugaard’s ensemble pieces, albeit after a break! This is my first exposure to the Grup Instrumental de València under Joan Cerveró and they immerse themselves in the Dane’s somewhat elusive material with wit and energy. In these pieces I don’t think I’m misrepresenting the composer when I sense a preference for rather deep sounds and quite generalised, pulsating textures which may reflect his interest in techno. I found all of these pieces absorbing up to a point, but I preferred Graugaard’s bigger pieces on the ‘Venus’ disc. Perhaps repeated listening to these new works will reveal clearer differences between them; ultimately their sound-world seems a little generic to these ears. The recording sounds a touch dry to my ears and consequently the brighter colours that Graugaard occasionally interpolates into these scores seem a little undersold.